I don't have a large mixer or beaters, so when I make cake, I usually use cake mix. Someday this will change, but for now I usually have quite a few boxes of cake mix on hand. The problem with that is my family can't usually finish a whole cake in time. 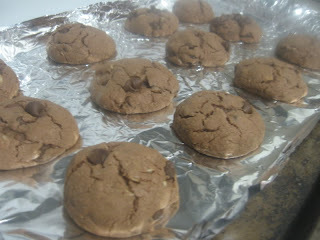 Cake mix cookies solve that in two ways...they last longer and they go quicker. Here are two recipes that have done us well. Preheat oven to 350 degrees. Put all the ingredients into a bowl and mix well with a spoon. Heat oven to 350 degrees. In large bowl, combine all ingredients; blend well. Next time I'm going to use half the chocolate chips and twice the oatmeal / raisins. Drop dough by rounded teaspoons 2 inches apart onto ungreased cookie sheets. Bake for 8-10 minutes or until set. Cool 1 minute; remove from cookie sheets. These recipes make for delicious cake-like cookies, that are huge hits in my house. I just found your blog on the Money Saver blog hop and look forward to following along hoping that you may want to do the same. These carrot cookies look awesome, my son was just telling us yesterday of how carrot cake is by far his most favorite cake :) I think I may have to try these out for him! These are some really cute cookies! Thank you for sharing the recipe with us!